2017 Fun Dives with Air Down There Scuba (A Happy Crew)! Please join us for an Adventure diving from the GLSPS Research and Work Vessel the "RV Preservation"
If you have never been on one, you are missing out on a great time! As a GLSPS Member, you have the benefit of joining the Staff of the GLSPS on the Society's Research Vessel. 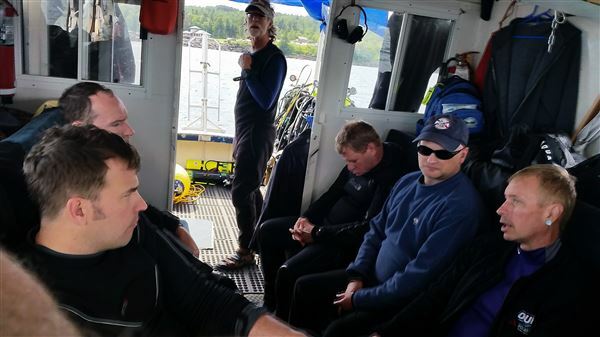 Any Dive Shop, Scuba Club or Scuba Facilities can Set Up an Event to Dive from the GLSPS Research Vessel. The only requirement is to become a Member of the GLSPS. If interested in joining us on one of our multipal events diving from the RV Preservation, please check out our 2018 Projects Schedule. Please click here the learn more about the June 30, to July 1, 2018 Event. Please click here to learn more about the August 25, 26, 2018 Fun Dive Event. If you are a GLSPS Member, please register ASAP or, if you are not a GLSPS Member, please become one and register for the event. We hope to see YOU on one of these events! New and current members are welcome! Crew: Phil Kerber (Captain), Jack Decker (Event Leader), Jeff LeMoine, Jim Christian, Tyler Christian, Paul Nistler, and Tim Pranke. This year’s Fun Dives on the R/V Preservation started slow. One week prior to the event, only one member had signed up. We decided to continue, knowing some members wait till the last minute to sign up in order to give others a chance. We ended up turning people away because the project filled up! Saturday came on bright, shiny, and calm waters, so we managed to get motoring on time to Split Rock Lighthouse and the Madeira. We splashed five divers twice on the Madeira. Seems this wreck always has more to show us, if we just take a bit of time and look. Three of us dove the boulders underneath the lighthouse, after lunch. The caves, boulders and passageways are fascinating and exhilarating to dive around. A few beach goers were a bit startled when we surfaced near the shore on the southern side of the point. Back at the marina, after supper together at a local restaurant, a near full moon low in the sky, good company and dutch oven brownies! Thanks Jim! Sunday morning we dove the Hesper. We went many directions, even exploring out away from the wreck. 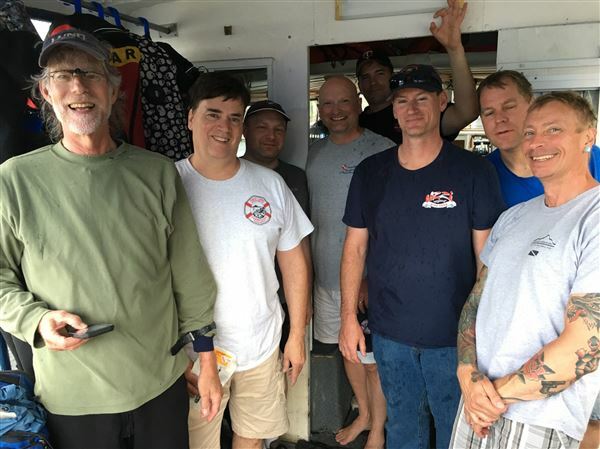 This event is put together to get our non active GLSPS Members together and experience first hand what it's like to dive off the Society's Research vessel the RV Preservation. Members can also see first hand how we do things on-board the vessel which we make as safe and organized as possible. We think that people would find it easier to join us on a project if they felt more comfortable being on board the vessel for a weekend. This is NOT a cattle boat like you would see with some Charters. It is an excellent way to join us and have the opportunity to be more active in the Society. What ever level you are, there is a place for you as a active member. We are always striving to gain new members and especially active members that like to dive and participate in the planning and implementing of the GLSPS projects. 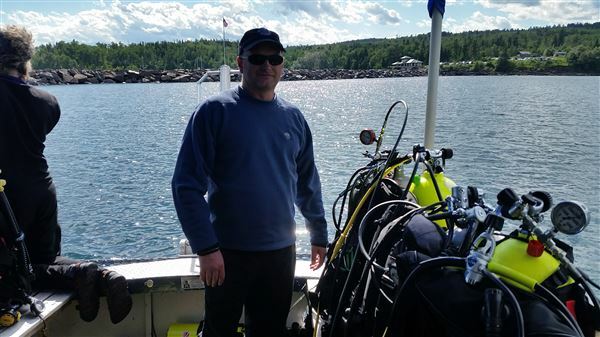 Diving off the GLSPS Research vessel is one of the benefits of being a member. This is without a doubt the largest benefit the members have and can enjoy, both divers and NON divers! Most project participants arrived Friday (August 24) evening and slepped on-board the vessel. We thought about a Friday evening dive on the Hesper but, no one bit on the opportunity. Saturday, August 25, after breakfast on board, we departed from the dock is 8:00 AM sharp! Since this is a “Fun Dive Event", departure is a little more relaxed than a typical work project. Generally, we can get 2 or 3 dives on the Madeira, and/or a dive under Split Rock Lighthouse. Lunch was served on-board after the second dive and tanks filled between dives. This year, the participants agreed to do a third dive on the Boulder Field below the Split Rock Light House. This was a good mix of lake bottom structure diving and shipwreck diving for the day and weekend. Dinner: Saturday night, we were all on our own with the group at a local restaurant. We all agreed to have dinner at the Camp 61 Hotel/Restaurant. After dinner, Jim Christen pulled out his Dutch Oven and baked us all some fresh brownies for desert. However, we were thinking that there was something missing?? AH, Jim asked, what is freshly baked brownies without Ice Cream? So we traveled to the Holiday and picked up some vanilla ice cream to add to the already delicious brownies Jim C made for us. After that special treat, we were all ready to turn it for the night. We were all spent from diving all day. we could have had a campfire on shore at the marina but, we just all went to sleep in our bunks to dive freshly the next day. Sunday: August 26, comes early as we head out and around the breakwater to the Hesper. This wreck is well protected and the weather was very calm today so participants enjoyed a very leisurely dive before heading back to the dock. We made only one dive then agreed to head back to the dock. We then unloading equipment and cleaned the boat before departure back home. Thank you to all that participated in Fun Dives. We hope you had fun diving experience with the shipwrecks, other active members and learned about GLSPS Projects and procedures. Hopefully, you will be able to participate in a future GLSPS Project.